Water is one of the most vital natural resources for all life on Earth. The availability and quality of water always have played an important part in determining not only where people can live, but also their quality of life. Even though there always has been plenty of fresh water on Earth, water has not always been available when and where it is needed, nor is it always of suitable quality for all uses. Water must be considered as a finite resource that has limits and boundaries to its availability and suitability for use. Figure 1. Offstream uses (depicted on the left) are those in which water is removed from its source, either by pumping or diversion. Instream uses (depicted on the right) are those in which water remains in place, and typically refers to stream (rather than groundwater). Where water supply is limited, conflicts may result between and among the various uses. The balance between supply and demand for water is a delicate one. The availability of usable water has and will continue to dictate where and to what extent development will occur. Water must be in sufficient supply for an area to develop, and an area cannot continue to develop if water demand far outstrips available supply. Further, a water supply will be called upon to meet an array of offstream uses (in which the water is withdrawn from the source) in addition to instream uses (in which the water remains in place). 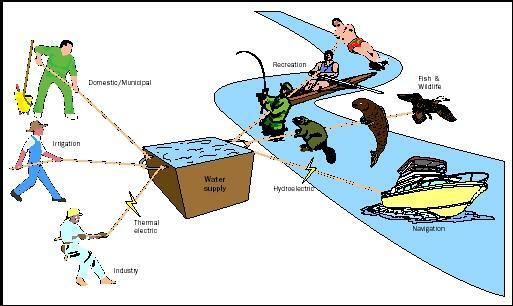 Figure 1 represents the demands on water as a tug-of-war among the various offstream and instream uses. Traditionally, water management in the United States focused on expanding or manipulating the country's supplies of fresh water to meet the needs of users. A number of large dams were built during the early twentieth century to increase the supply of fresh water for any given time and place. This era of building large dams has passed. In the twenty-first century, the finite water supply and established infrastructure require that demand be managed more effectively within the available sustainable supply. Water-use information can be used to evaluate the impacts of population growth and the effectiveness of alternative water management policies, regulations, and conservation activities. The water-use cycle is composed of the water cycle with the added influence of human activity. Dams, reservoirs, canals, aqueducts , withdrawal pipes in rivers, and groundwater wells all reveal that humans have a major impact on the water cycle. In the water-use cycle, water moves from a source to a point of use, and then to a point of disposition. The sources of water are either surface water or groundwater. Water is withdrawn and moved from a source to a point of use, such as an industry, restaurant, home, or farm. After water is used, it must be disposed of (or sometimes, reused). Used water is either directly returned to the environment or passes through a treatment processing plant before being returned. The U.S. Geological Survey compiles nationwide water-use data every 5 years. The year 1995 is the last year for which full datasets are available. As Figure 2 shows, the United States in 1995 used about 402,000 million gallons of water per day (MGD). Most of this water use was fresh water, about 341,000 MGD, or about 85 percent, while 60,800 MGD was saline water. The majority of fresh-water withdrawals, about 264,000 MGD, or about 77 percent, came from surface-water sources, while about 76,400 MGD came from groundwater. The source of saline water is surface water. Even though discussions of water use typically focus on fresh-water use, saline water use also is important in the United States. Some categories of water use, such as thermoelectric, industrial, and mining, use saline water, mainly for cooling generators in thermoelectric power plants. Industries and mines use saline water to cool machinery and to wash and transport products, mainly for cooling of machinery. The U.S. Geological Survey categorizes water use for analyzing current patterns and predicting future trends. Commercial water use includes fresh water for motels, hotels, restaurants, office buildings, other commercial facilities, and civilian and military institutions. Domestic water use is probably the most important daily use of water for most people. Domestic use includes water that is used in the home every day, including water for normal household purposes, such as drinking, food preparation, bathing, washing clothes and dishes, flushing toilets, and watering lawns and gardens. Industrial water use is a valuable resource to the nation's industries for such purposes as processing, cleaning, transportation, dilution, and cooling in manufacturing facilities. Major water-using industries include steel, chemical, paper, and petroleum refining. Industries often reuse the same water over and over for more than one purpose. Figure 2. This illustration summarizes water withdrawals in the United States in 1995. The bar chart depicts fresh-water withdrawals (in billion gallons per day, or BGD). The table includes fresh-water and saline withdrawals (in million gallons per day, or MGD). nurseries, turf farms, cemeteries, and other landscape irrigation uses. The importance of irrigation to the United States is illustrated by the large amount of fresh water that is used to cultivate crops, which are consumed domestically and throughout the world. In fact, irrigation is the largest category of water use in the United States, as it is worldwide. Livestock water use includes water for stock animals, feed lots, dairies, fish farms, and other nonfarm needs. Water is needed for the production of red meat, poultry, eggs, milk, and wool, and for horses, rabbits, and pets. Livestock water use only includes fresh water. Mining water use includes water for the extraction of naturally occurring minerals; solids, such as coal and ores; liquids, such as crude petroleum; and gases, such as natural gas. The category includes quarrying, milling (such as crushing, screening, washing, and flotation), and other operations as part of mining activity. A significant portion of the water used for mining, about 32 percent, is saline. Public Supply water use refers to water withdrawn by public and private water suppliers, such as county and municipal water works, and delivered to users for domestic, commercial, and industrial purposes. In 1995, the majority of the nation's population, about 225 million, or 84 percent, used water delivered from public water suppliers. About 42 million people supplied their own water, with about 99 percent of that water being groundwater, usually from a local well. Thermoelectric Power water use is the amount of water used in the production of electric power generated with heat. The source of the heat may be from fossil fuels, nuclear fission, or geothermal. Fossil fuel power plants typically reuse water. They generate electricity by turning a turbine using steam power. After the steam is used to turn the turbines, it is condensed back to water by cooling it. The condensed water is then routed back to the boiler, where the cycle begins again. After continual increases in the nation's total water withdrawals (fresh water and saline water) for the years reported from 1950 to 1980, withdrawals declined from 1980 to 1985 and remained fairly constant from 1985 to 1995. The 1995 estimate of total withdrawals (402,000 MGD) is about 2 percent less than the 1990 estimate and nearly 10 percent less than the peak year of 1980. Likewise, total fresh-water withdrawals for 1995 were about 8 percent less than in 1980. The decline in withdrawals is especially significant in light of the fact that population posted an increase of 16 percent during the same period. Clearly as a nation, the United States is using its surface water and groundwater resources more efficiently. This decline signals that water use responds to economic and regulatory factors, and that the general public has an enhanced awareness of water resources and conservation issues. The public supply, domestic, and livestock categories are the only categories to show continual increases from 1950 to 1995, largely because of continual increases in population. The increase of 4 percent in public supply withdrawals from 1990 to 1995, compared to the population increase of 7 percent served by public supply, indicates that conservation programs have been effective in lowering public supply per capita use from about 184 gallons per day (GPD) in 1990 to 179 GPD in 1995. More water continues to be withdrawn for thermoelectric power generation than for any other category. Withdrawals for thermoelectric power generation peaked in 1980 at 210,000 MGD and fluctuated around 190,000 MGD during 1985, 1990, and 1995. Industrial withdrawals declined from 1980 to 1995 after remaining about the same for the years reported between 1965 and 1980. Lower industrial withdrawals are the result of new industries and technologies that require less water, improved plant efficiencies, increased water recycling; changes in laws and regulations to reduce the discharge of pollutants; and conservation measures. Total irrigation withdrawals were about the same during the period from 1955 to 1960, then steadily increased from 1965 to 1980, and gradually decreased from 1980 to 1995. Irrigation application rates vary from year to year and depend on annual rainfall, surface water availability, energy costs, farm commodity prices, application technologies, and conservation practices. Declining application rates are the result of more efficient irrigation systems and techniques. Also, application rates in the more humid eastern United States, where irrigated acreage continues to increase, tend to be lower than in the arid western United States. Figure 3. 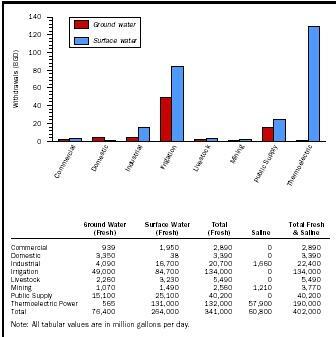 A chart of fresh-water withdrawals from 1950 to 1995 reveal trends in total water use and the relative withdrawals from groundwater and surface-water sources. (Values are in billion gallons per day, or BGD). The U.S. population also is depicted (in millions). Most of the increases in water use from 1950 to 1980 were the result of expansion of irrigation systems and increases in energy development. The development of center-pivot irrigation systems and the availability of plentiful and inexpensive groundwater resources supported the expansion of irrigation systems. Higher energy prices in the 1970s, and large drawdown in groundwater levels in some areas increased the cost of irrigation water. In the 1980s, improved application techniques, increased competition for water, and a downturn in the farm economy reduced demands for irrigation water. The transition from water-supply management to water-demand management encouraged more efficient use of water. New technologies in the industrial sector that require less water, improved plant efficiencies, increased water recycling, higher energy prices, and changes in laws and regulations to reduce the discharge of pollutants resulted in decreased water use. The enhanced awareness by the general public of water resources and active conservation programs in many states have contributed to reduced water demands. Water-use trends established over the past half century provide some basis for estimating future water demands. 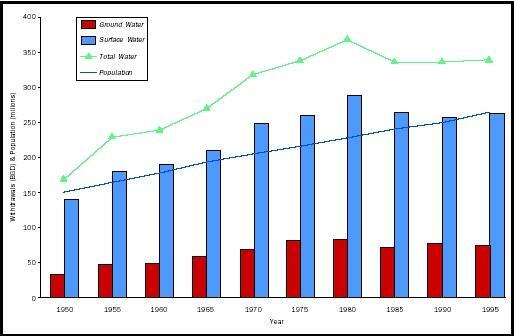 It seems likely that water withdrawals for public supply and domestic uses will continue to increase as population increases. Higher water prices and active water conservation programs, however, may reduce the per capita use rates. With increased competition for water for instream uses, such as river-based recreation, aesthetic enjoyment, fish and wildlife habitat, and hydroelectric power, along with higher municipal uses, irrigators will have increasing difficulty competing economically for available water supplies. In the United States, many existing sources of water are being stressed by withdrawals from aquifers and diversions from rivers and reservoirs to meet the needs of homes, cities, farms, and industries. Consideration must also be given to leaving water in the streams and rivers to meet environmental, fish and wildlife, and recreational needs. As planners, managers, and elected officials wrestle with the varied water management problems facing the nation at the beginning of the twentyfirst century, they need consistent information on water supply and use by state, watershed, and water-use category. This will help the United States realize the maximum benefit from its water resources and will help strike that crucial balance between supply and demand. SEE ALSO Agriculture and Water ; Demand Management ; Drinking Water and Society ; Hydroelectric Power ; Hydrologic Cycle ; Instream Water Issues ; Irrigation Management ; Reclamation and Reuse ; Recreation ; Supply Development. Solley, W. B., Pierce, R. R., and Perlman, H. A. "Estimated Use of Water in the United States in 1995." U.S. Geological Survey Circular 1200 (1998). Perlman, Howard. "Water Use in the United States." Water Science for Schools. U.S. Geological Survey. <http://ga.water.usgs.gov/edu/wateruse.html> . * See "Hydrologic Cycle" for a diagram illustrating the water cycle. this article is nice and interesting to read...hope you have more articles for water because these kinds of articles are useful for students in their projets, homeworks, etc. exactly what i need for my english project! This article is very useful and also we can use for many projects and also should add a little more information. This article is very good but it does not contain enough information. While this would be great for a child in grade 3 but until the time you reach grade 5 you have to have extra knowledge, not the same which becomes kiddish. I hope the designer of this website can ad extra features to it. I'm curious, how do I cite this?